This is the first comprehensive study of the Danish film company, Nordisk Films Kompagni, in the silent era. Based on archival research, primarily in the company’s surviving business archives, this volume of KINtop describes and analyzes how Nordisk Film became one of the leading players in the world market and why the company failed to maintain this position. This volume is written from perspective of Nordisk Film as a business and organization, from its establishment in 1906 until 1924 when founder Ole Olsen stepped back. 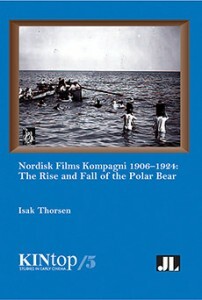 Among the many topics and themes this volume examines are the competitive advantages Nordisk Film gained in reorganizing the production to multiple-reel films around 1910; the company’s highly efficient film production which anticipated the departmentalized organization of Hollywood; Nordisk Film’s aggressive expansion strategy in Germany, Central-Europe and Russia during the First World War; and the grand plans for taking control of UFA in association with the American Famous Players in the post-war years.